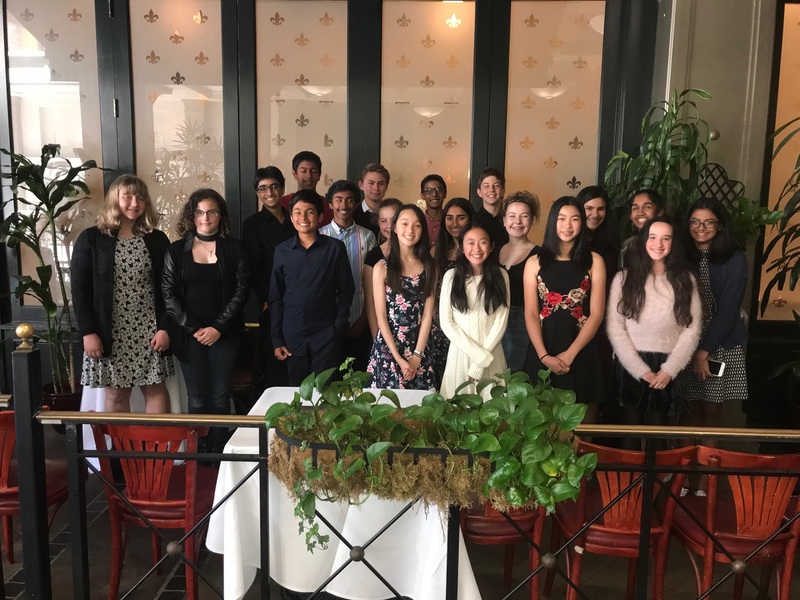 In mid-April, middle school French teacher Carol Parris and her French 2M students visited the Left Bank restaurant at Santana Row for a taste of French food and culture. “We had a leisurely meal in the les Amis room, a lovely private dining room,” Parris said. Students enjoyed appetizers of French bread and fries while waiting for their orders to arrive. “I believe that the most popular luncheon was the croque monsieur, a French grilled ham and cheese sandwich, served with a salad, but the chicken and vegetarian pasta received a thumbs up as well,” Parris said. Not surprisingly, the dessert of two profiteroles (pastry shells with a vanilla ice cream filling and chocolate sauce topping) proved to be the most popular menu item among students.